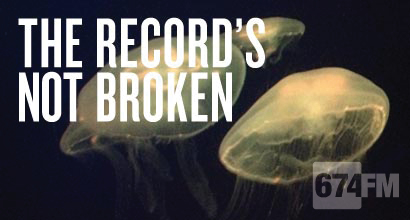 Craig and Garret bring you a new series of ‘The Record’s Not Broken’ an eclectic mix of music from their extensive and rather odd record collections. Each episode brings you new tunes, old school favourites and a studio full of friends and special guests. Special Guest Mixologist Stuart Bales mixes drinks in the studio, amazing cocktails each inspired by a specific track. muddle melon and basil, add rest of ingredients and shake together with ice. In a rocks glass add angostura and syrup, and stir 10 times. add 25ml bourbon and stir 25 times, add another 25ml bourbon and stir another 25 times. Add apple and cherry juice, and garnish with a lemon twist.